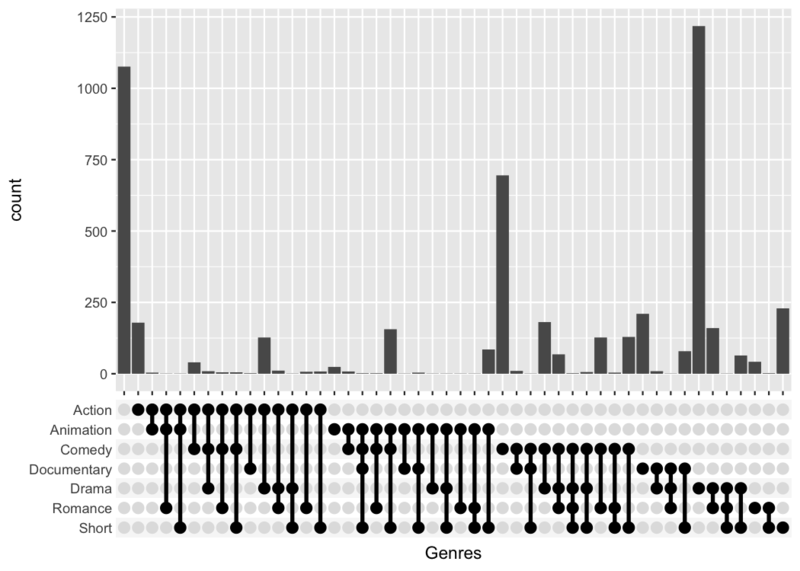 Replace the standard x-axis in 'ggplots' with a combination matrix to visualize complex set overlaps. 'UpSet' has introduced a new way to visualize the overlap of sets as an alternative to Venn diagrams. 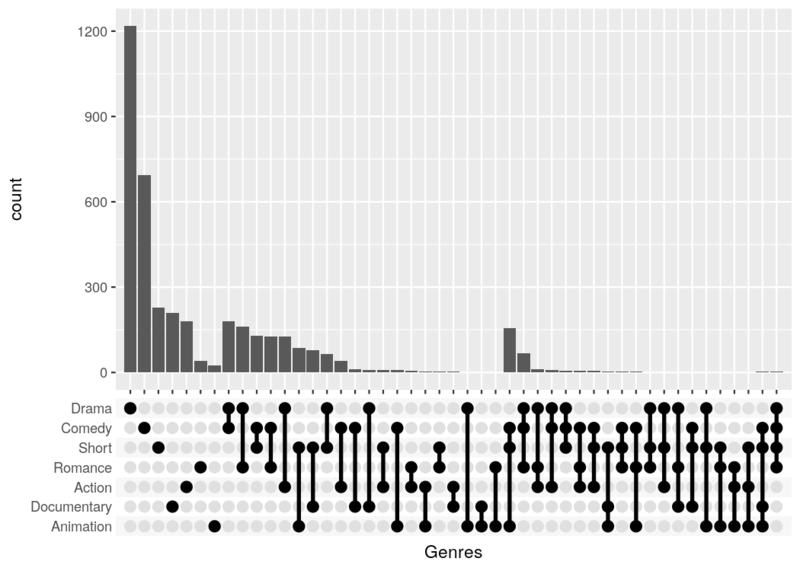 This package provides a simple way to produce such plots using 'ggplot2'. In addition it can convert any categorical axis into a combination matrix axis. 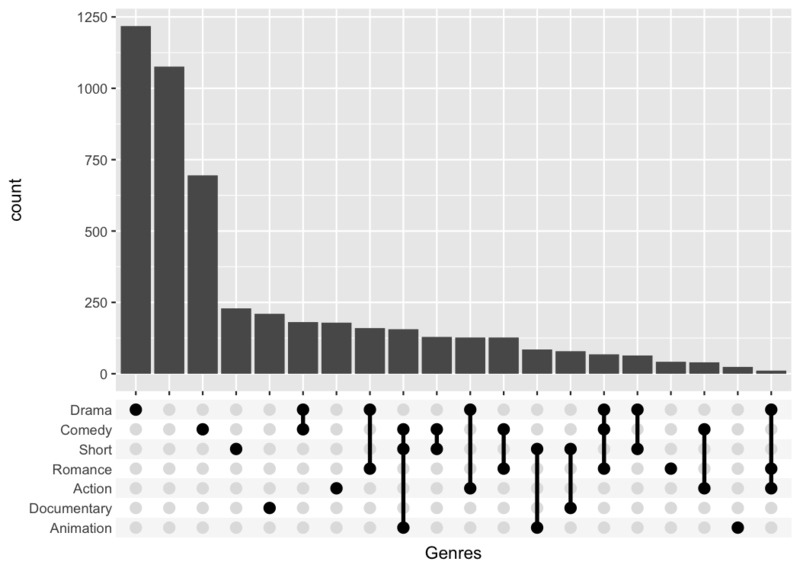 Plot a combination matrix instead of the standard x-axis and create UpSet plots with ggplot2. ggupset makes it easy to get an immediate impression how many movies are in each genre and their combination. For example there are slightly more than 1200 Dramas in the set, more than 1000 which don't belong to any genre and ~170 that are Comedy and Drama. #> Warning: Removed 100 rows containing non-finite values (stat_count). 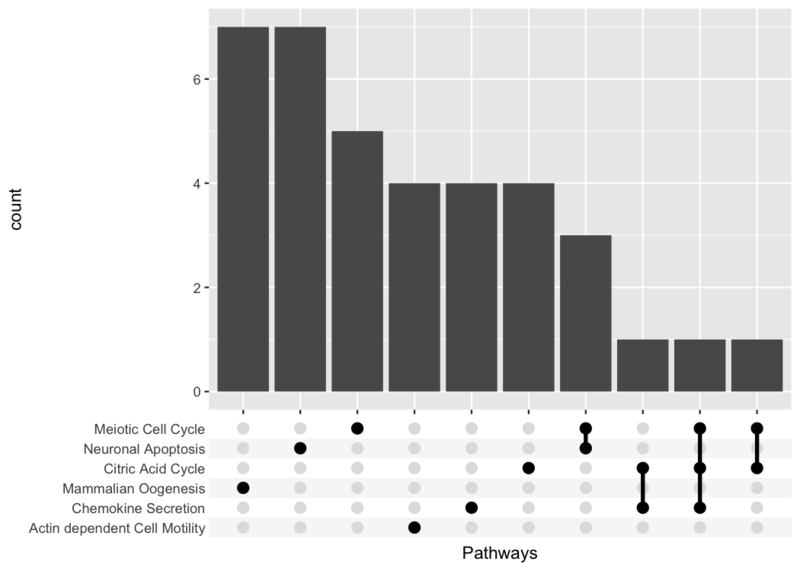 scale_x_upset is a neat function that does several things at once to create a useful x-axis. I will now step by step recreate the plot to demonstrate some of the underlying ideas. #>  3 Mind Benders, The                       <chr > ""
#>  4 Trop (peu) d'amour                      <chr > ""
#>  7 Visiblement je vous aime                <chr > ""
Because the process of collapsing list columns into delimited strings is fairly generic, I provide a new scale that does this automatically (scale_x_mergelist()). But the problem is that it can be difficult to read those labels. Instead I provide a third function that replaces the axis labels with a combination matrix (axis_combmatrix()). One thing that is only possible with the scale_x_upset() function is to automatically order the categories and genres by freq or by degree. #> Warning: Removed 1076 rows containing non-finite values (stat_count). To make publication ready plots, you often want to have complete control how each part of a plot looks. This is why I provide an easy way to style the combination matrix. 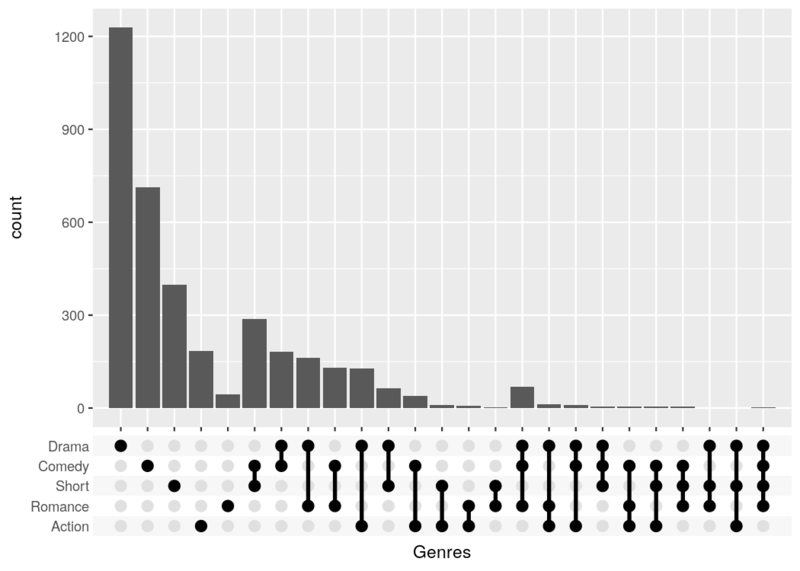 Simply add a theme_combmatrix() to the plot. There is already a package called UpSetR (GitHub, CRAN) that provides very similar functionality and that heavily inspired me to write this package. 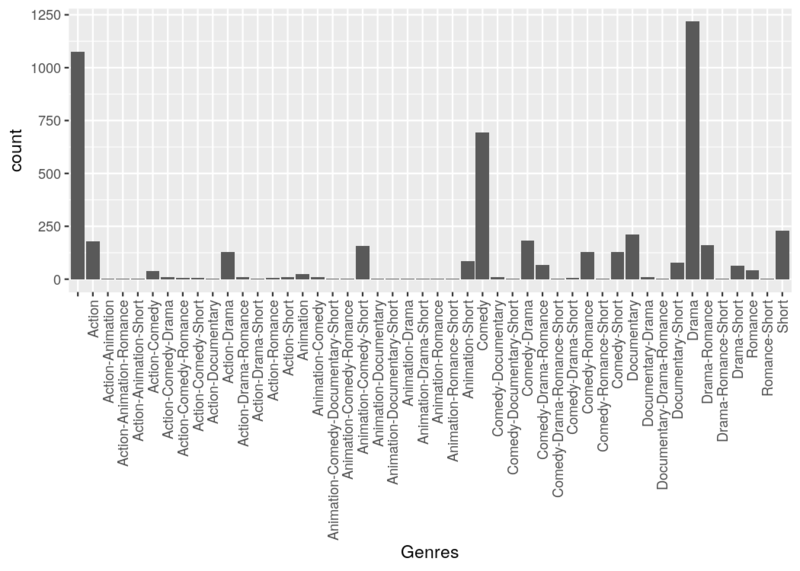 It produces a similar plot with an additional view that shows the overall size of each genre. #> Warning: Removed 1311 rows containing non-finite values (stat_count). 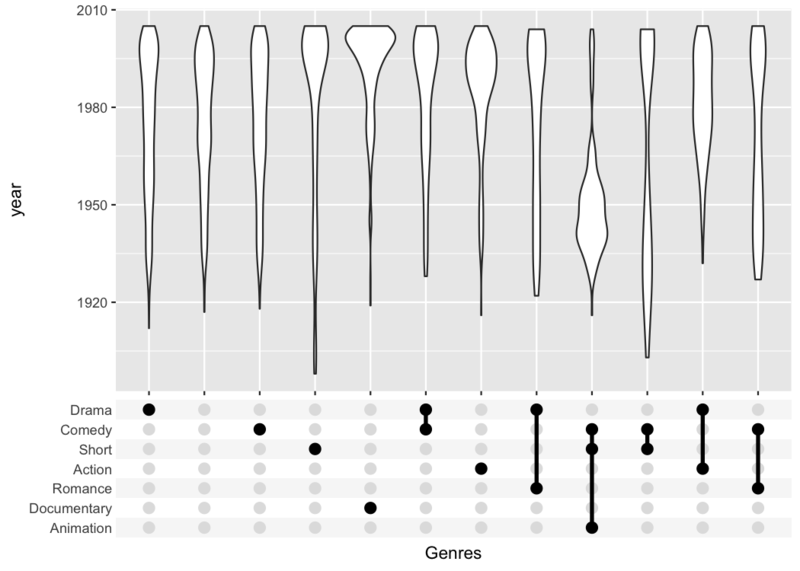 The UpSetR package provides a lot convenient helpers around this kind of plot; the main advantage of my package is that it can be combined with any kind of ggplot that uses a categorical x-axis. This additional flexibility can be useful if you want to create non-standard plots. The following plot for example shows when movies of a certain genre were published. #> Warning: Removed 513 rows containing non-finite values (stat_ydensity). The combination matrix axis can be used to show complex experimental designs, where each sample got a combination of different treatments. #>  2 TRUE  Yes           8    105. #>  4 TRUE  Yes           8    140. #>  5 TRUE  Yes           8    108. #>  7 TRUE  Yes           8    112. #>  8 TRUE  Yes           8    118. #>  9 TRUE  Yes           8    114.
dplyr currently does not support list columns as grouping variables. 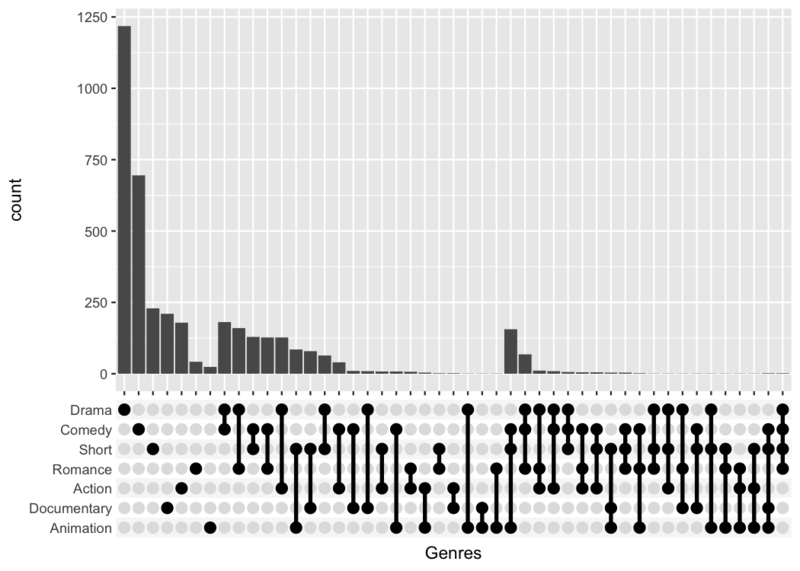 In that case it makes sense to collapse it manually and use the axis_combmatrix() function to get a good looking plot.